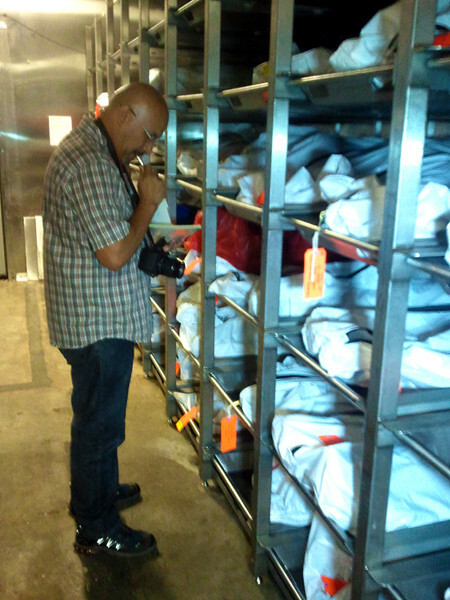 I visited the Medical Examiner's office and the Devil's Highway, where most of the bodies of the migrants tagged “John Doe” were recovered, as part of the film project produced by Presente.org with the help of filmmaker Jason Michael Aragon of Pan Left Productions. Our goal: to document the impact of border security policies on communities living and working--and traveling--in and around border towns like Tucson. “Don't stay in [the freezer] too long,” Dr. Gregory Hess, the very gregarious and straight-laced Chief Medical Examiner, told us as if he were Virgil warning Dante against being too curious about the Inferno. “We try to get in and out as quickly as possible. After a few minutes in there, the smell will stick to your clothes--and it's hard to wash out.” Forty-five minutes of filming later, we more than understood the cold wisdom Dr. Hess was dropping on us. Breathing in the spirits of the dead causes an intense conflict in the stomach, a conflict between profound sadness and the amino to live and fight on. Hess' matter-of-fact statements add even more tightness in the belly. 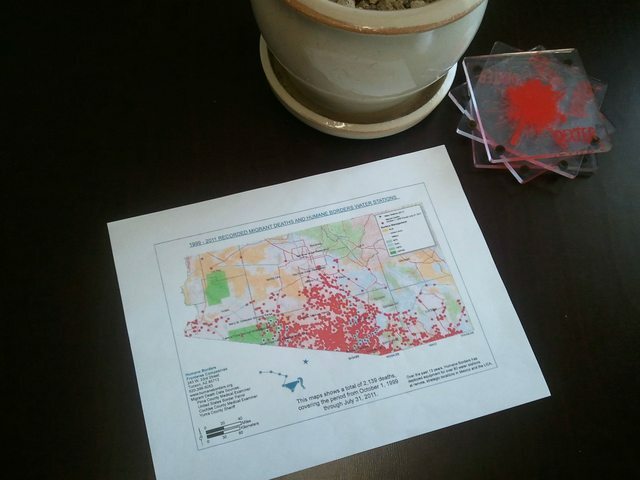 In the fight to end border militarization and what activists in Tucson and other border states call the “border overkill” at the heart of comprehensive immigration reform, nothing in Tucson or anywhere else matches the persuasive power of the smells emanating from the stiff, dehydrated and decomposing dreams stored in white body bags; Not Hess' map with the red dots signifying locations of the more than 6,000 immigrants who have died from heat and dehydration in the desert since “increased border security” began in earnest in 1994; Not the scholarly reports on Hess' bookshelf with titles like “A Continued Humanitarian Crisis at the Border”; Not the colorful crosses used in protests against “border militarization” and “racial profiling” of entire border communities; Not even the tears and pain-packed words of mothers like Guadalupe Guerrero who told us about how her unarmed US citizen son, Carlos, was shot and killed by Border Patrol agents. None of these facts and stories match the gut-wrenching smell I first came to know in the 1980s and ’90s, when the war in El Salvador filled “fosas comunes” (mass graves) with the skeletons and dirt-filled clothes of with victims of war. Two weeks after I visited Tucson, the smell in the freezer inspires the will to peace, the necessary will to end the war--in this case, the war on immigrants. In the same way that smells and steam of desert plants like the ceresote, sage or the hediondilla (literally “little smelly one”) plant have long been used by local native and Mexican people as curative plants that relieve gut-wrenching pain and discomfort and other ailments, the smell of the freezer can and should cure us of the disease of “border security.” And in doing so, we will have made the bodies of the desert dead in the bags a little less anonymous--and a little more like the long line of peacemakers in the desert.